As a parent and a Netflix subscriber, I am always on the lookout for fun Netflix movies for kids that I can watch with them. 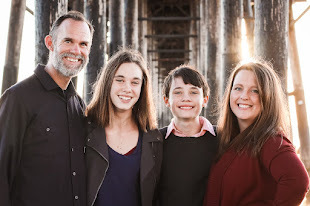 Recently, my tween daughter and I have enjoyed curling up and watching romances. If you have a Netflix subscription and a tween girl, you might want to check out some of these fun movies on Netflix streaming. We've seen most of these, although, some of these Netflix streaming movies are still on our list. A Cinderella Story (PG) - Hillary Duff and Chad Michael Murray star in this modern day high school take on the classic Cinderella fairytale. Queen of Katwe (PG) - Based on a true story. Queen of Katwe is the inspiring story about one Ugandan girl who rises above not only her circumstances but her own self doubt to become a chess champion. There are so many good life lessons in this movie! 13 Going on 30 (PG-13) - Possibly the penultimate tween/pre-teen movie starring Jennifer Garner and Mark Garafalo. For your information, does include some more adult themes but overall a great movie for older tweens and young teens. Princess: A modern Fairytale (TV-PG) - This is a sweet romantic made-for-tv movie that is perfect for tween girl who loves all things princesses. I even enjoyed it as an adult. Nancy Drew (PG): Stars a young Emma Roberts as an updated version of the classic crime solving teen Nancy Drew. I grew up reading Nancy Drew books, so this is a fun one to watch with the kids. The Parent Trap (1961) (G) - This is the original 1961 movie starring Haley Mills as twin sisters who were separated and later reunited at summer camp unbeknownst to their divorced parents. A definite charmer! Annabelle Hooper and The Ghosts of Nantucket( PG) - This is actually one we haven't seen. WE love Bailee Madison so we are excited to add this to our list. It's a story about a teenage mystery writer (Madison) who encounters a real life ghostly mystery of her own. Albion: The Enchanted Stallion (TV PG) - The story of a girl, who, after being sent by a magical horse, must go on a quest to save the enchanted land. The Last Mimzy (PG) - And imaginative story about two siblings who discover a strange box of toys. The soon develop some other worldly powers. This is another one we haven't seen. The Princess Bride (PG) : Sword fighting, adventure, and of course true love. This classic fairytale movie is a delight. Parents should know there are a few scary-ish parts that can be fast forwarded for younger tweens if desired. The Decoy Bride (PG): Starring Doctor Who's David Tennant. This is a romantic comedy that puts a young woman in the middle of a couple about to be married. Emma (PG) - Jane Austen's novel Emma about requited and unrequited love. Starring Gwyneth Paltrow, Jeremy Northem, and Toni Collette. 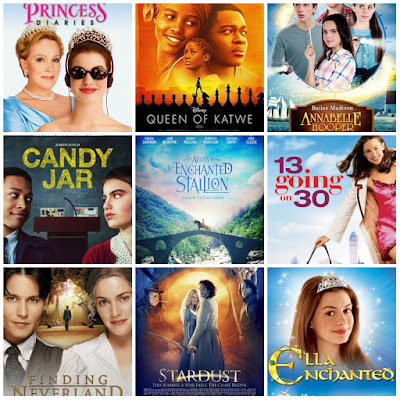 Ella Enchanted: Great for younger girls too, this cinderella story with a twist is a fun and quirky comedy with an independent female lead and a positive message. The Golden Compass (PG) - This fantastical story follows an orphan as she trades a life of ___. Features supporting roles from the likes of Nicole Kidman, Daniel Craig and more! Anabelle Hooper and The Ghosts of Nantucket (TV-PG) - Teenage mystery writer, played by Bailee Madison discovers there is more to the island of Nantucket than meets the eye. The Princess Diaries (G) - A young teenage girl is thrust into the life of a princess after she discovers she is the granddaughter of the Queen of a fictitious kingdom called Genovia. This charming Disney movie that was made in the early 2000's holds up over time. The Princess Diaries 2: Royal Engagement - This is the second chapter in this cute franchise about an unlikely princess. does she have what it takes to rule the Kingdom of Genovia? Stardust (PG-13) - I've had this movie on this list before. It's about Star-crossed lovers and the fantastical world they come from. We loved it, but the end may be scary for some young tweens, hence the PG-13 rating. I would preview before you show it to your kids. Stars Claire Danes, Michelle Phieffer, and Robert De Niro. Finding Neverland (PG) - Based on the story of how James Barrie came to write the famous Peter Pan. Does tackle some adult themes of death and dying. Probably best for older tweens and early teens. Nancy Drew (PG) - Teen sleuth Nancy Drew uncovers a mystery. This is an updated version of the classic book series starring a young Emma Roberts. Newsies: The Broadway Musical (G): Occasionally Netflix has shown the original newsies movie starring Christian Bale, but it's not currently offered. The next best thing? The recorded broadway musical. Better than seeing it live! Lost in Space (TV-PG): While this Netflix original is technically a series, the first episode functions quite a bit like a movie. Full of action, adventure, science fiction. It places young women in central roles to the story. Robin Hood, Prince of Thieves - (PG-13) Better for older tweens and early teens. It's a 90's move that stands the test of time. Does include some darker themes including brief witchcraft, and a brief tush shot that you can fast forward through. Sisterhood of the Traveling Pants (PG) - Based on the book of the same title, this heartwarming coming of age drama follows 4 best girl friends who part ways over the summer but are connected through a mysterious pair of pants that seem to fit all four girls and ignites a confidence in each of the girls. They pass the pants on to each other throughout the story. It's heartfelt and resonates with tweens and young teen girls that are navigating the changing world around them. All four girls shine in their performances. Earth To Echo (PG): A modern adventure and creative spin on the youth alien movie genre. Kids who love technology will love this one especially. Great for 10 years and older. Pride and Prejudice (2005) - Staring Keira Knightly. Shorter than the beloved mini-series and has more of a modern tone. Haven't seen this one in a while, but probably good for 11 years and older. Ever After (PG) An adaption of the classic Cinderella story. Angelica Houston really steals the show as the Evil Stepmother. It Could Happen to You (PG) - A cop comes up short on pocket change for a tip and promises a waitress half of his potential winnings from a lottery ticket. Has a great message about what's important in life. Freaky Friday (PG) - A great remake of the original. Akeelah and The Bee (PG)- A wonderful movie featuring a strong female lead who is striving to compete in a regional Spelling Bee. I was disappointed to see that Netflix stopped streaming this one, it's one of our absolute favorites! The Perfect Game (PG) - Although it's centered around a boy's baseball team, the themes are important and relatable for all kids. Harriet The Spy (PG) - A fun movie featuring a strong independent female lead who learns some important life lessons under the guidance of her nanny. Perfect for the younger tween ages. Parent Trap: A decent remake of the original. Although I am somewhat partial to the Haley Mills version, Natasha Richardson shines as the girls' mother. From Time to Time - A british movie about a young boy who travels in time on his families estate to unlock mysteries of his family's past. He befriends a young girl along the way. Sabrina (PG) - This remake of the Audrey Hepburn original is a charming, winsome and dreamy romance and somewhat of a coming of age story for the lead character. Stars Harrison Ford and Julia Ormond. The Audrey Hepburn version is also on Netflix. A little side note: Netflix, and really the entertainment industry in general really needs to work on their representation of young girls of color in movies. Black and brown girls need to see themselves represented as strong, smart, and capable young women. Also, not every tween girl wants to watch a princess story. Some love science, some love adventure, some love mysteries! 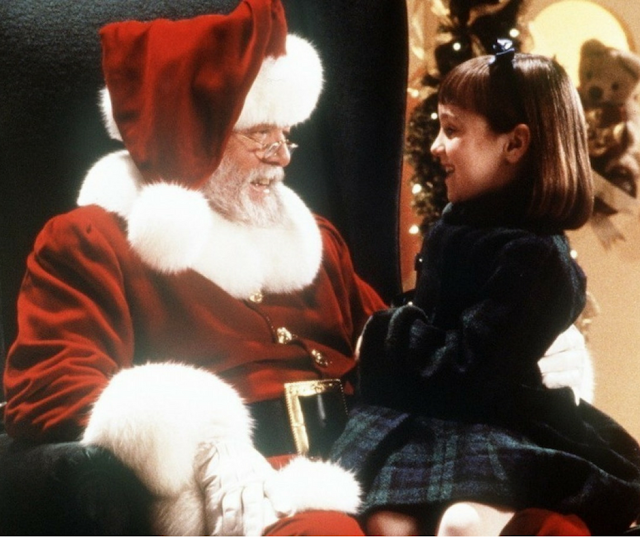 If you liked this, you might want to check out our list of the best movies on Netflix for families. 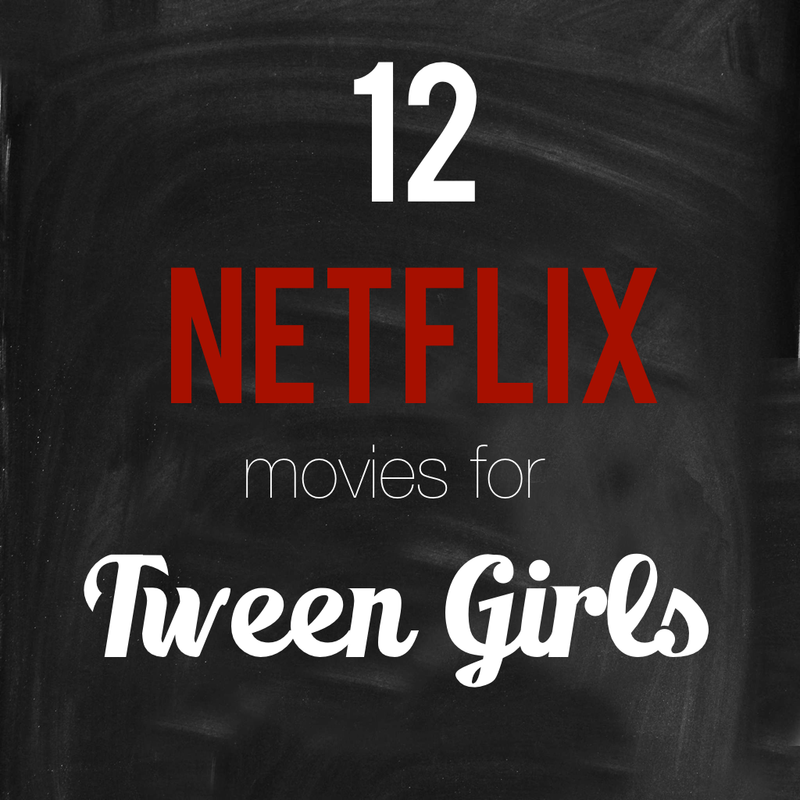 Did we miss your favorite streaming Netflix movie for tween girls? What would you add to this list?